"Why Love Is Not Enough: The Potential Risks Involved in Adopting from Home or Far Away"
Welcoming a New Brother or Sister through Adoption is a 2010 Mom’s Choice Awards® Gold Recipient among adult adoption books and is Winner of the 2010 Benjamin Franklin Award as best book in the Psychology genre! Adoption is a big step which can change the whole dynamics of the family. It is crucial that parents understand the impact it has when new sibling relationships are forged as the adoptee becomes a part of the family. 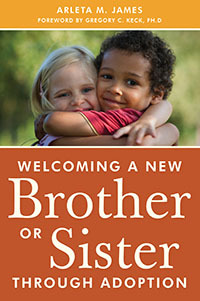 Welcoming a New Brother or Sister through Adoption is a comprehensive yet accessible guide that describes the whole range of the adoption process and the effects of adoption on every member of the family — parents, brothers, sisters and the adoptee. It prepares families to have realistic expectations and equips them with knowledge to deal with a host of situations that may arise following the adoption. Questions like,' did we make the right choice by adopting? How is this affecting our typical children? Will our adopted son or daughter heal?' are explored and solutions discussed in detail. All these accompanied with real life cases as examples make it a realistic and insightful resource. This book is vital reading for adoptive families and professionals who work with them including social workers, counselors and psychologists. Copyright © 2011 - 2013 Arleta James. All rights reserved.